A general comment I made in an earlier post about the Nova Infinity warrants further clarification about what I like about the Infinity, and what concerns me about another system (as highlighted by the “Easy Chuck”). 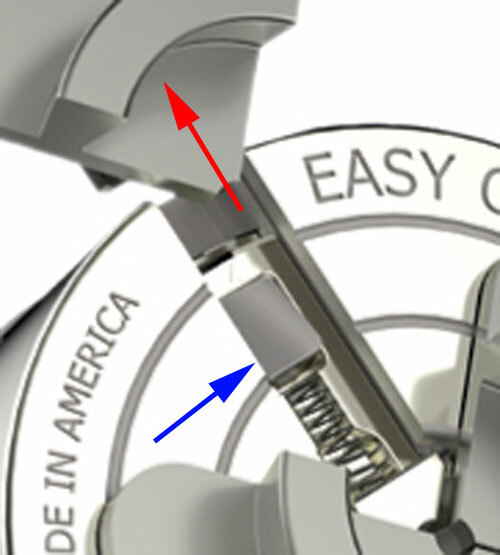 Please note, my original article did not make mention of any other specific brand, so this new article is a direct response to the question posed in the comments of the earlier post, which is why it includes reference to the Easy Chuck product. Please also note, this is my own opinion, and I have not performed any tests or made any formal assessment of either chuck. If that key becomes worn, if the spring becomes weak, what I see is a potential for the jaw to feel engaged to the user, but could be released from the key during operation. 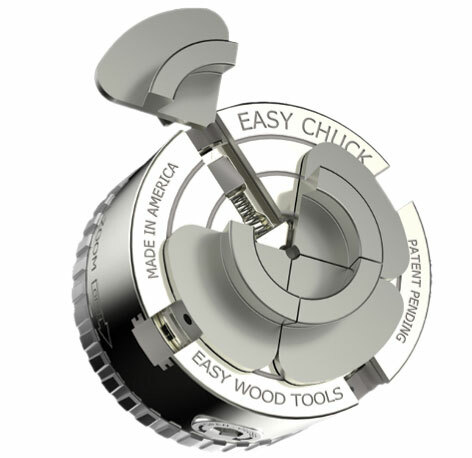 While the chuck is new, not likely to be an issue. But what happens in years to come as the chuck is heavily used? Is there a mechanism that positively stops the jaw from being able to fly out if the key disengages? The jaw slides in from the side, so the primary direction of force is resisted by a permanently fixed shoulder. Furthermore, during normal turning operations, the v-shaped wedge is forced further into the slot, so even if the restraining mechanism fails, normal operation will still restrain the jaw in position. If turning in reverse, then yes, it is again reliant on the mechanism, but all 4 would need to fail, and you tend not to use a lot of force when the lathe is reversed in any case (and most lathes can’t do that). 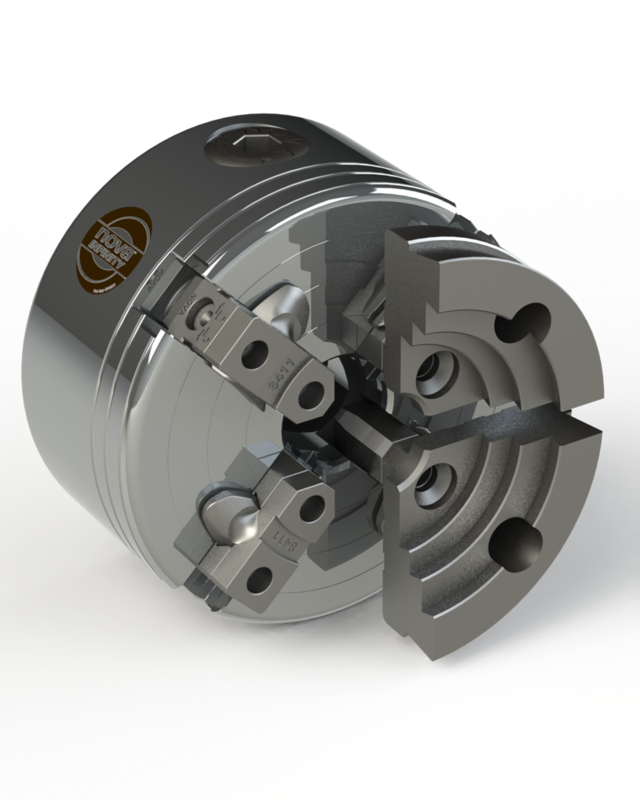 So two very different approaches to a quick jaw changing chuck. And the reasoning behind my comment. BTW, what you can see here is the kit that allows owners of existing jaw sets to be able to upgrade them to make them useable on the Nova Infinity chuck. Nice that it can also equally be undone as necessary, without any more difficulty than if the jaw you wanted to use was fixed to any other chuck. 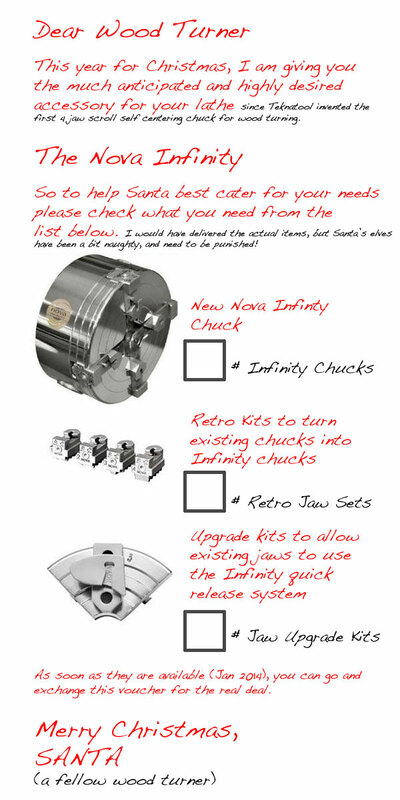 Based on this, I’ll probably look at getting a few of the upgrade kits, so pretty much all my jaw sets can be used on the Infinity, and upgrade most of my chucks as well with the retro fit kit.. Apparently, the Infinity system will be available in January next year – might have to add it to a Christmas wish list. Perhaps Nova should come out with a free wish list card so turners can tick what they would like (new chuck, # retro kits, # jaw upgrade kits), then they can have that given to them for Christmas, and trade it in for the real thing when the sets become available!